a count is comprised of 140,000 fingerprint marks of ink-like gunpowder on vintage gauze bandages (including WW II and Vietnam bandaging found on eBay) . The fingerprint marks count the estimated casualties in Afghanistan and Iraq – both military and civilian – resulting from the response to the attacks on September 11, 2001. Each casualty imprinted with my own body is a way of personally meditating on the loss of individual lives as well as the magnitude of the collective destruction. These marks appear to bleed through the fabric, staining material meant to staunch and heal. Yet in wetting the gunpowder it is rendered inert, and thus a volatile material of destruction is transformed into the instrument of creation. 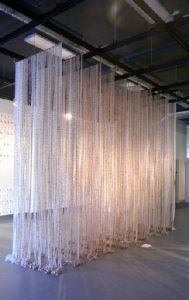 Installed from floor to ceiling, the streamers hang like peace flags from suspended rods. Click here to watch a video about the creation of a count.